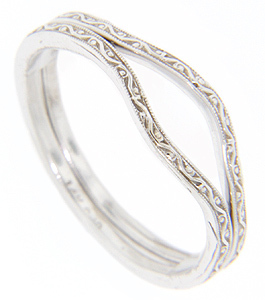 An undulating design decorates these 14K white gold curved wedding bands. 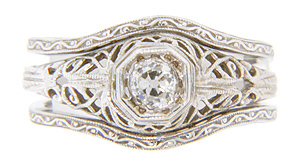 The modern rings have a somewhat gradual curve and feature a milgrain design on the edges. The bands each measure 1.5mm in width and are perfect for layering and stacking with other rings; especially engagement rings. Size: 7. We can re-size and reorder. The bands are frequently purchased as a set for $480.00 but they are also available individually.